Holy Toledo! 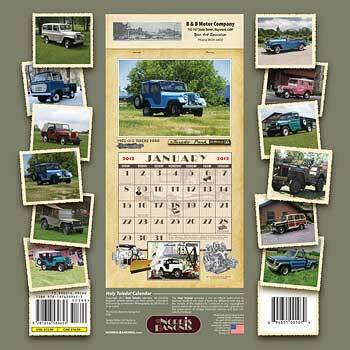 Just when we were worried that the absolute best wall calendar for fans of vintage vehicles might be at the end of its five-year run, it turns up with a new name and a bunch of classic "Jeep" (don't say that out loud!) photos that are better than ever. The lack of the "Jeep" name is not a disadvantage. In fact, the new name, and the cover photo of a 1961 Maverick wagon that looks like the original stretch-limo SUV, might inspire people who were never "Jeep" fans, to pick up the calendar and take a look. And it is perhaps appropriate that the exact origin of the phrase "Holy Toledo!" is as uncertain and as hotly debated as the origin of the name "Jeep." When you get inside, you will find probably the most fascinating collection of vintage Jeep photos and trivia to be found anywhere outside of CJ3B.info. In addition to the big monthly color pictures, Bill Norris and Kevin Banonis keep expanding the amount of Willys literature and notable dates in history, sprinkled across each page. Not an inch of this big, glossy publication goes to waste. OK, let's get down to the nitty gritty: what Jeeps are featured this year? Well, don't worry, there's a nice high hood, in the form of Dennis West's '54 CJ-3B, a regular at the Spring Willys Reunion. And a bunch of other "small Jeeps" including a great photo of the Knight sisters' Surrey, with all of the side curtains in place. There is also another nice Dispatcher, two rare WWII jeeps, and a '65 Tuxedo Park. On the senior side, there are three pickups, two station wagons, and one of the nicest Jeepster photos you have ever seen. And can you handle any more good news? The promised Norris-Banonis fire truck calendar has also appeared this year. It's their entry into a market which is a little more crowded, but "Classic Fire Apparatus" should do well because it uses the same concept of a beautiful layout and lots of little extras added to the page each month. And there's a Jeep Fire Engine included. "Holy Toledo!" as well as "Classic Fire Apparatus" and "Broken Down Heroes" are available online or by mail. 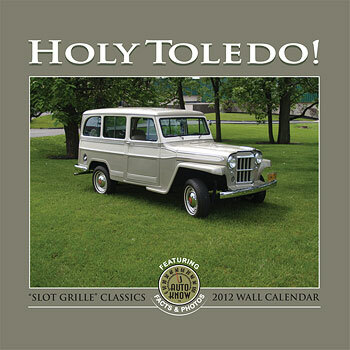 A big plus factor of Holy Toledo's new copyright freedom, is that the calendar is finally available for shipping outside North America.